In 1993, the 350th anniversary of Breskens’ entry into Yamada Bay was held in Yamada Machi which strengthen and deepen the friendship between Yadama Machi and the city Zeist in the Netherlands. This event brought the opportunity of sending the 1st Junior Delegation to Zeist city in January 1996. While the town was planning another delegation visit in 2011, the big earthquake hit Tohoku Area, and due to the extensive damages caused by the mega-Tsunami on 11th March 2011, they had to freeze this project plan. Oranda Jima Foundation thought it is too sad not to realize their planning as this would be a great opportunity for children to see the world. So we made an offer to the town of our support to realize the project. We believe it would be worth for experiencing for children who will be bearers of the city in future. Kindly, KLM Royal Dutch Airlines in Japan donated 14 return tickets for this project. Yamada Machi composed the delegation with 9 junior high school students, 2 high school studens and leaders. They left Yamada Machi on 6th January 2013 and flew over to Amsterdam, the Netherlands from Narita Airport. During the flight, the captain invited students into cockpit which was a very special and extraordinary experience for them. During their stay in Zeist for more than a week, they were taken care by the local host family, experiencing the life in the Netherlands, visting city hall, welcoming at CLZ school, joining the lesson at school, and visiting Zeits castle, and more and more, and returned to Yamada Machi on 16th January. 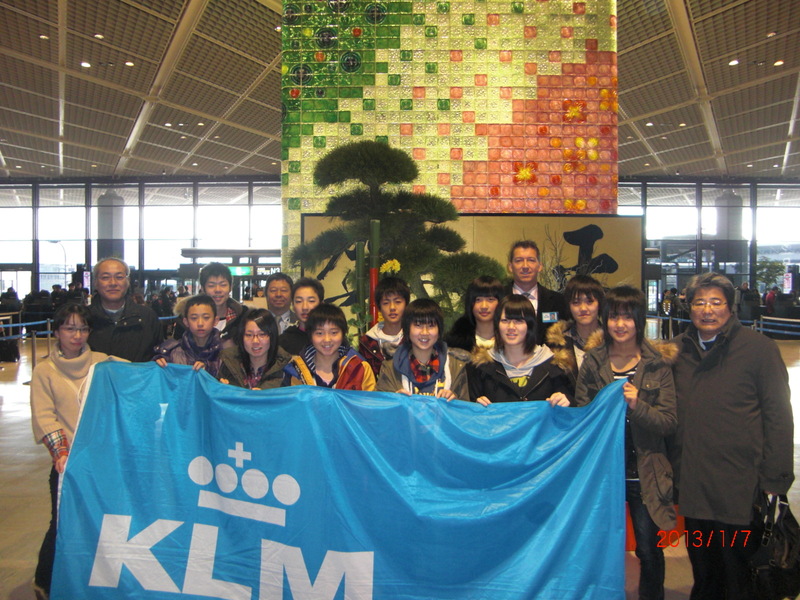 Thanks to the kind offer by KLM Royal Dutch Airlines in Japan, the project was realized !